Silicon nanowire (SiNW) is a promising material for micro-supercapacitors (μ-SCs). However, the practical application of SiNW μ-SCs is hindered due to the instability of Si in aqueous solutions. Here, we demonstrate that the overall capacitive properties of SiNW μ-SCs can be improved by a facile TiO2 coating treatment. In this study, SiNWs were fabricated by metal-assisted chemical etching and TiO2 was spin-coated on SiNWs. With the optimal processing condition, the TiO2-coated SiNWs (T-SiNWs) exhibit an areal capacitance of 2.69 mF cm−2 at the scan rate of 50 mV s−1 and 3.55 mF cm−2 at the current density of 0.1 mA cm−2, respectively. Further, an enhanced rate capability of T-SiNWs is observed owing to the TiO2 coating. Moreover, a retention of 68.8% is obtained by T-SiNWs after 1000 galvanostatic charge–discharge cycles, which is higher than that of the bare SiNWs. The reasons for the capacitive property enhancement of the electrode materials were also investigated. 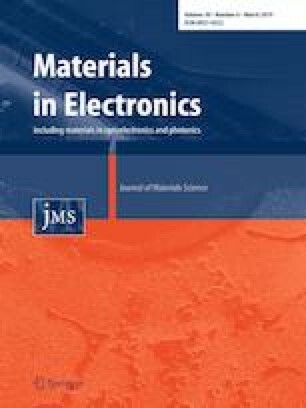 The authors thank Opening Project of Jiangsu Key Laboratory of Advanced Structural Materials and Application Technology (ASMA201602), Open Fund of Key Laboratory of Materials Preparation and Protection for Harsh Environment (Nanjing University of Aeronautics and Astronautics), Ministry of Industry and Information Technology No. 56XCA17006-1 for financial support.